What Can I Do With the MailChimp Integration? The Nimble + MailChimp Integration allows you to send contacts from Nimble to MailChimp to add them to an existing mailing list. This integration does not sync contacts from MailChimp to Nimble and we do not currently sync email stats to Nimble. This will come in a future update. Select your set of contacts for your mailing list and select "Export" on the Contact list action bar. A window will appear. 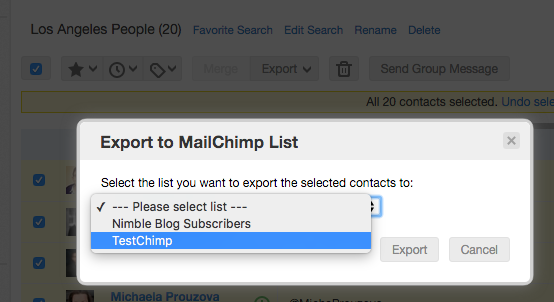 Select in the dropdown, your desired list in MailChimp that you want to export your contacts to. Nimble will send you a confirmation email that your contacts have been imported into MailChimp. Once you've sent your contacts from Nimble to MailChimp, sign into MailChimp to send your campaign. How do I locate my MailChimp API Key? 2. Click create a key, or copy a current key. 3. In MailChimp, copy the API key to your clipboard. 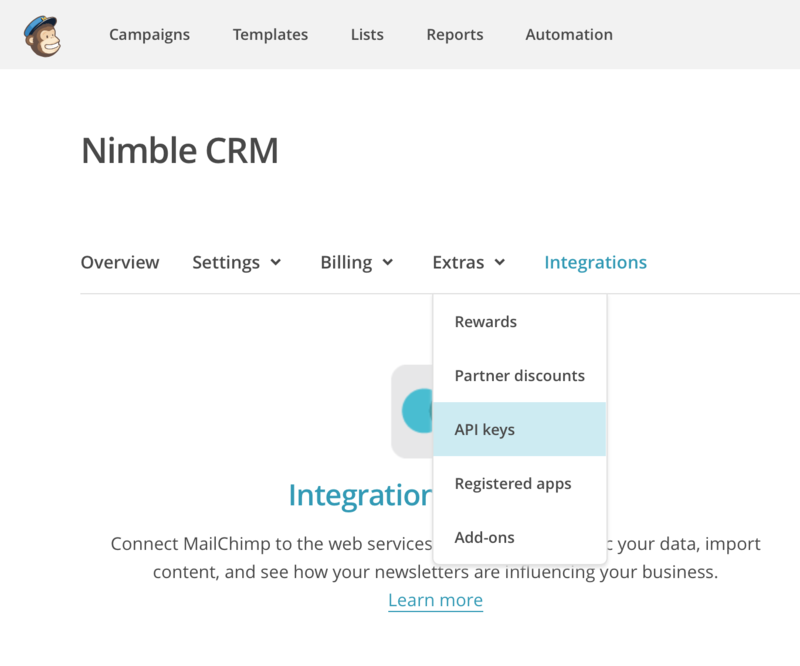 In Nimble, go to Settings >> Third Party Integrations >> MailChimp, select "Enable", and paste the API key in the "MailChimp API key" field and select Enable. How do I View Recently Added Contacts in MailChimp? 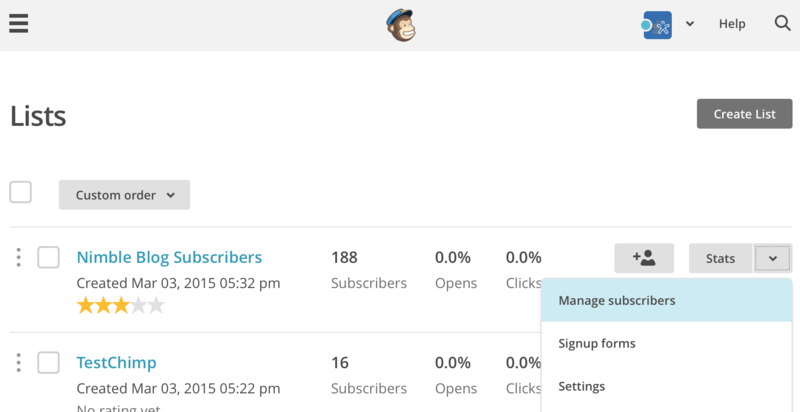 View recently added contacts by going to your MailChimp list and then selecting "Manage Subscribers". Select "Date Added" to check your most recently added subscribers. Note: Anyone exporting from Nimble to MailChimp must be an administrator or manager in MailChimp. If they are not, they need to ask their MailChimp Administrator to adjust account privileges. As of now, there is no two-way sync with MailChimp and Nimble. Nimble does not record/track MailChimp emails sent to contacts.